NPR || Is 2016 The Year Virtual Reality Finally Goes Mainstream? You have probably been hearing a lot about virtual reality in the past couple of years; this coming year you finally may get to try it. Several major consumer headsets are hitting the market, allowing users to experience everything from travel, games, news and shopping. But it's not clear whether that will be enough to entice consumers to spend a few hundred bucks on a VR headset. Brian Blau thinks it will be enough. The analyst at Gartner, a tech market-research firm, has watched dozens of people don a virtual reality headset for the first time. "When they put it on you can just really see the light bulbs go off," Blau says. "They get it right away ... within the first minute or two they turn their head around. They instantaneously realize, like, 'Wow! I am transported.' "
After having my own first experience with VR nearly two years ago I understand what he's saying. I tried a re-creation of HBO's Game of Thrones. I got a ride — virtually — on the winch elevator of the Castle Black wall in the fantasy kingdom, and it was more real than any 3D movie I'd ever watched. It ended with an arrow being shot into my heart. It didn't hurt, but it sure looked real as it came at me. I was using an Oculus Rift VR headset. A few months later Facebook paid $2 billion to buy the company. In the first half of this year Oculus is scheduled to hit the market, along with two other high-end virtual reality headsets — Sony's Project Morpheus and HTC's Vive. Blau says the quality of the content will be crucial to the success of these headsets. "Ultimately it's really up to the game developers and the content developers to really provide great user experiences" Blau says. Jaunt VR, which recently got $65 million of investment from Disney and Madison Square Garden company, is helping develop some of that content. It already has been working with Disney-owned ABC News to create virtual reality experiences — including a visit to the historic sites of Damascus, Syria, in which viewers can go to the top of a citadel and see the entire city spread out around them. Jaunt CEO Jens Christensen thinks news is going a big category for virtual reality. "You suddenly feel like you're actually there, and you get a sense of scale," he says. "This type of news content I think is really powerful in VR — you get a sort of a humanizing experience that you don't really get when you have a screen in front of you." This past year The New York Times began to experiment with virtual reality, providing experiences such as a journey with children displaced by war. A camera developed by Jaunt VR features more than 12 lenses arrayed around a basketball-sized device. The device may be used to develop content for headsets built by three companies, all coming out in 2016. The new world of production for virtual reality is a work in progress. 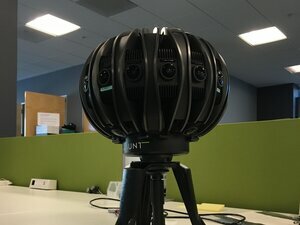 At its Palo Alto headquarters Jaunt has developed the equipment to shoot and edit these experiences, including a basketball-sized camera with more than a dozen lenses wrapped around it. Koji Gardiner, who helped develop the camera, says they've had to overcome problems like synchronizing the lens shutters together. Before solving that, if you were watching someone walk on a virtual reality headset, he says "you (would) see them disappear between a stitch between two cameras ... they disappear and reappear in the camera next to it, and that's due to those not being synchronized." Of course, there is no guarantee that all this investment in equipment is going to pay off — many people have compared the enthusiasm for virtual reality with the failed experiments in 3D TV. That got millions of dollars in investments too, but viewers still had to don special glasses, and the technology has yet to catch on. Analyst Blau doesn't see VR technology following that route. "I think when you look at virtual reality it is such a different type of experience that it's hard to make those comparisons stick," he says. The video game experience may be one way that virtual reality takes off this year — and gamers may share that experience with their parents and grandparents, opening the VR experience another audience and laying the groundwork for a new art form and industry.